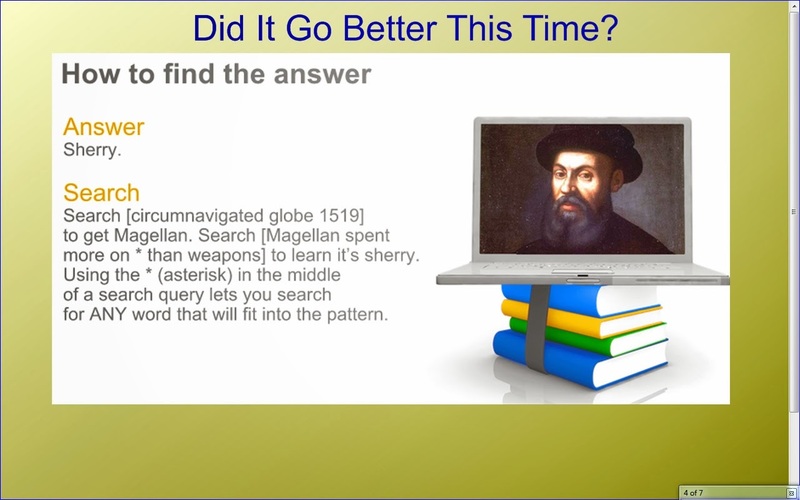 My freshmen are learning about the brave, and sometimes greedy and devious, explorers of the 15th and 16th centuries. It seemed like a perfect metaphor for teaching them to be brave, yet wise, explorers of the Internet as well. 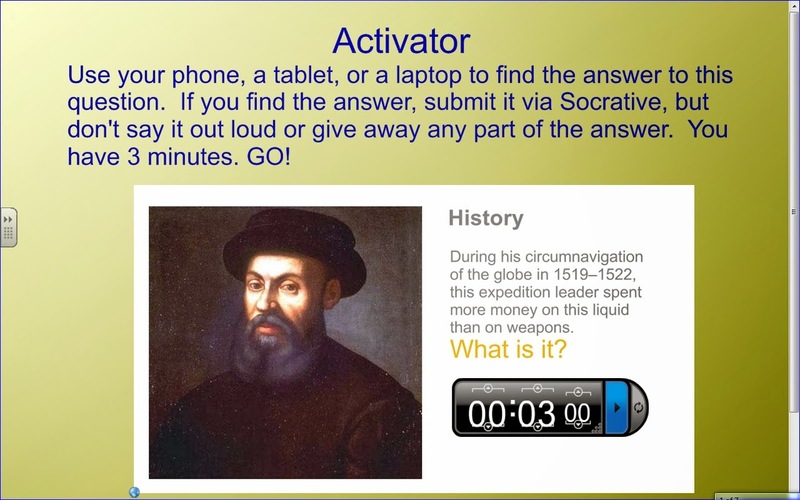 The lesson activator was meant to get my 9th graders in the competitive spirit. 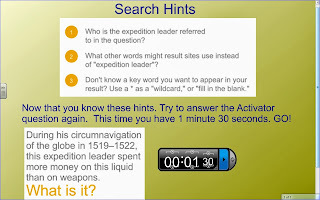 Of course, the first question I got as students buried their noses in the iPads and smartphones was, "Who is the expedition leader?" Ha ha ha.... I looked at them knowingly, smirked, and turned away. They were frustrated, but they were getting the idea. About 1/3 of each class figured out the right answer in the 3 minute window. Next I gave them some search hints. By the end of the second timed session, the students who got it the first time were able to get it again almost instantly. Of the students who hadn't been successful in the first round, about 75% were able to submit the answer this time. Now that my students had new searching skills, it was time to find out what they would do with the search results. 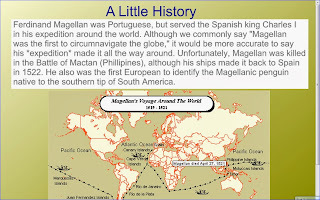 Earlier in our unit, I exposed the truth about Columbus and his actions once landing in the New World, something I posted about last month. So I decided to challenge students to find a more heroic explorer to replace him in our calendar of federal holidays. 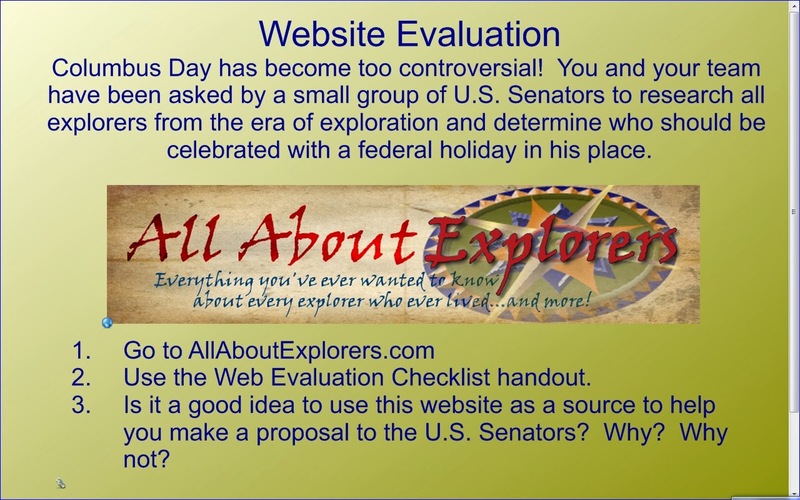 Of course, the challenge would require research and a bogus website on explorers was there to answer my call. 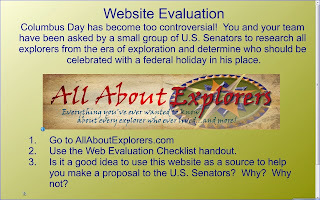 If you visit AllAboutExplorers.com you will find out that the creators are teachers and librarians looking to create a real live lesson for their students on the web. 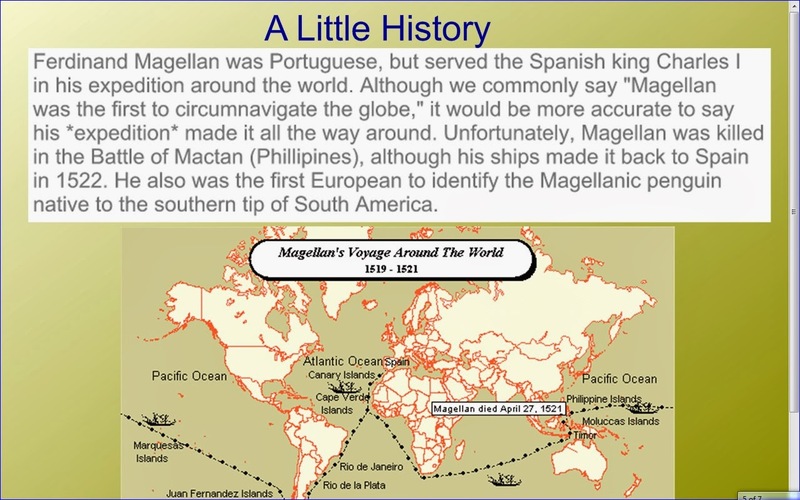 You will also read that some of the articles, like the one on Francisco Pizarro, are accurate and others, like the one on Hernando de Soto, are just silly. It teaches students to read through the information on the site, read about the authors, and investigate the sponsoring organization. 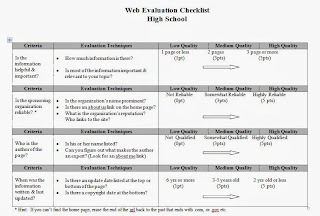 To evaluate the site, I used a protocol drawn up by EasyBib librarians. 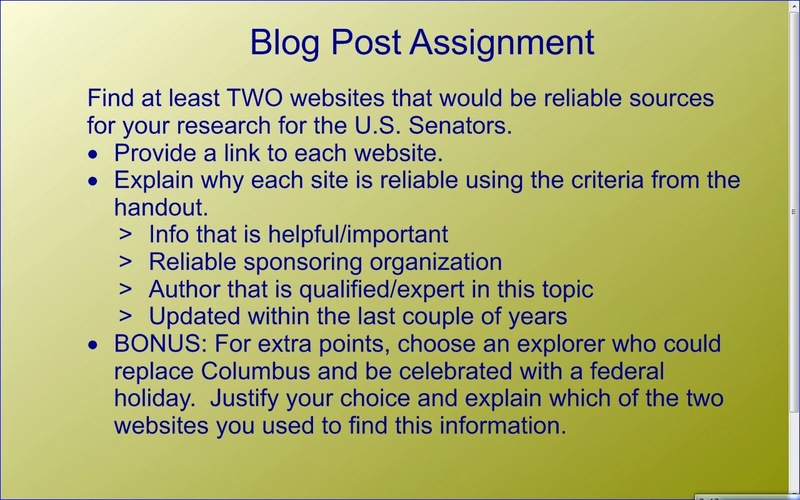 Based on the criteria of this protocol, a website that earns a minimum of 16 points would be permissible for use in a historical research project. I heard students giggling as they worked together and reading some of the ridiculous facts about the explorers receiving faxes and living on the Jersey Shore aloud to each other. By the end of the 50 minute class period, they got the idea. So I gave them a follow-up assignment to check for understanding. Samantha's post shows that she understands that all websites have their flaws, but as long as they meet certain criteria, they can be considered reliable. 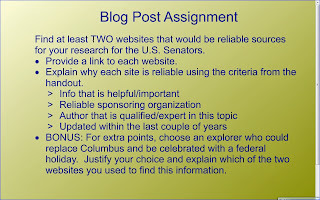 Kyle's post demonstrates that he understood what made Columbus controversial and what makes a website reliable. I'm looking forward to assigning a small research project soon to test their new found knowledge of reliability on the Internet. Overall, I think it was worthwhile to spend one class period on a combination of history and web literacy. 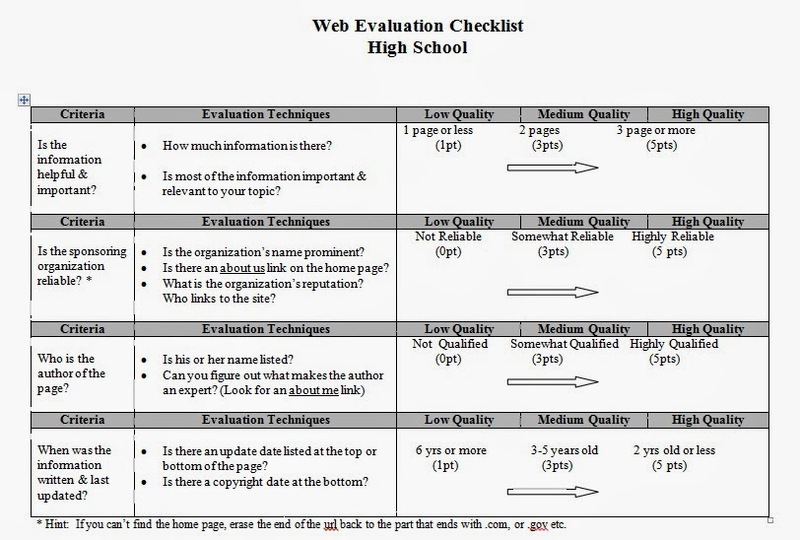 How Should I Grade You?